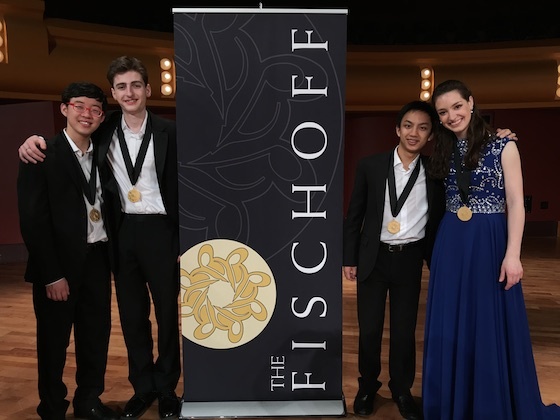 May 14, 2018, 3:21 PM · Congratulations to the winners of the 45nd annual Fischoff National Chamber Music Competition! Top winners included the Cleveland Institute-based Callisto Quartet, which won both the Grand Prize and Senior String Division Gold Medal; and the Kairos String Quartet from the Academy of the Music Institute of Chicago, which won the Gold Medal in the Junior Division. The Kairos has had quite a month, having also won first prize in the Junior Division of the M-Prize just last week. The Fischoff competition was held over the weekend at the University of Notre Dame in South Bend, Ind., with 49 ensembles competing (12 each in the Senior String and Wind Divisions and 25 in the Junior Division). The ensembles represented 28 countries and territories (including 25 U.S. states). Those had been narrowed down from a total of 136 ensembles that applied for the 2018 competition. 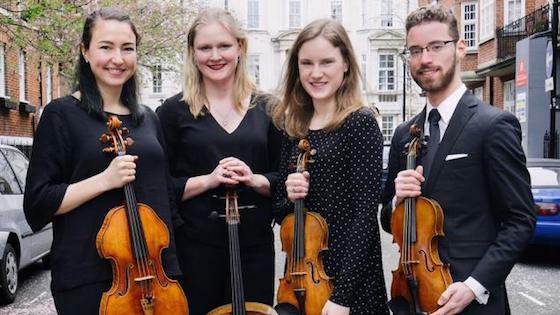 The Callisto Quartet, 2018 Fischoff Grand Prize and Senior Strings Division Gold Medal winners. Photo by Mike Grittani. Colburn School, Los Angeles, Calif. The Kairos String Quartet, 2018 Fischoff Junior Division Gold Medal winners. Academy of the Music Institute of Chicago, Evanston, Ill.
Read about winners in the Junior and Senior Wind Divisions here. The competition was founded in 1973 by Joseph E. Fischoff and and members of the South Bend (Ind.) Chamber Music Society. This competition was the last one for Fischoff’s executive director Ann Divine, who has served in that role for 24 years. Each division had separate juries; jury members for the Senior Strings Division included violist Victoria Chiang; violinist Simin Ganatra; cellist Paul Katz; and pianist Anne-Marie McDermott. Jury members for the Junior Division included pianist Judith Gordon; cellist Daniel McDonough; bassoonist Ryan Reynolds; and violinist Janet Ying. May 15, 2018 at 03:47 PM · Congratulations to both Callisto and Kairos! I watched the livestream and both quartets were simply incredible! I could not believe that the members of Kairos were still in high school.